This year we saw a number of artists break into the mainstream with refreshing, genre fluid albums. In R&B, Electronic, and Rap music, three artists in particular stood out as promising new stars. SZA’s Ctrl took over mainstream airwaves alike by blending pop with rap and alternative R&B. Kaytranada did what he does best on 99.9% by effortlessly combining electronic music with house, funk, and R&B. In rap, the California group BROCKHAMPTON was all the buzz after they dropped two albums with rock and funk instrumentals and energetic group verses. All three projects had huge influence on pop culture these year, and for this reason they are FORM’s top picks this season. SZA, a Maplewood, New Jersey native and singer songwriter, splashed onto the scene this past summer with the release of her debut solo album Ctrl. SZA is the only female member of California rap collective TDE, and garnered considerable buzz from her memorable feature on Rihanna’s “Consideration” in 2016. Her album Ctrl, with hit singles such as “Love Galore” and “The Weekend”, speaks to the woes of today’s twenty-somethings with its themes of self doubt, self exploration, and unapologetic sexuality. Though most of the album is carried by her own voice and narrative, SZA calls on TDE labelmate Kendrick Lamar on the standout track “Doves in the Wind” and James Fauntleroy on the ephemeral interlude “Wavy”. Her entire album evokes a mood of nostalgia with 90’s track title references like “Go Gina” and “Drew Barrymore” or with instrumentals reminiscent of late 80’s pop on “Prom”. The self acceptance and carefreeness she expresses on her album comes through in her style, which is also 90’s inspired and an androgynous mix of masculine and baggy with feminine and formfitting. Known for her wild curls and effortless tomgirl swagger as much as for her hypnotic melodies and smooth voice, SZA is the embodiment of the intersection between music and style. Ctrl brought some desperately needed freshness and originality to the female R&B scene and is surely only the beginning for SZA. Kaytranada, real name Louis Kevin Celestin, is a Haitian-Canadian DJ who began his career going viral from his fresh remixes of R&B and hip hop classics on Soundcloud. He made his debut with his first studio album 99.9% in early May. Even though Kaytranada had success touring from the popularity of his Soundcloud tracks, he still lived in a basement with his brother and slept on a twin bed. He was desperate to make his mark and curate his own sound with an original, full length commercial project. On 99.9%, Kaytranada creates a tracklist with his signature, genre-defying blend of R&B, house, and funk. He also collaborates with similarly genre-fluid and buzzing artists in hip hop and R&B such as GoldLink, Vic Mensa, Anderson Paak, and Syd. Kaytranada flexes his production muscles on the hit single “Glowed Up” featuring Anderson Paak, with a two part instrumental that begins with a futuristic uptempo beat and ends slow paced. Songs like “You’re the One” featuring Syd are more reminiscent of his Soundcloud work, combining heavy bass and synths with an intoxicating R&B vocal laid over top. Though the songs are diverse, the entire album takes the listener on a ride with a cohesive groove and can be enjoyed in any setting. Kaytranada’s fanbase had high expectations for this young artist whose musicality had the potential to completely take over electronic music, and with 99.9%, he did just that. BROCKHAMPTON, an American hip-hop collective based in California, is redefining the meaning of “American Boy Band”. Founded by Texas native Kevin Abstract in 2015, has so far brought together musicians, producers, artists alike to create a growing creative entity. Through their second album Saturation, part of a trilogy, they have placed a firm foothold in the musical industry. In the same month as its release, Viceland announced a series called American Boyband to feature BROCKHAMPTON as its main subject. Each member serves an integral part to the collective, which is quite evident through the chemistry on record as well as off. Effortlessly cool and intertwined, it’s hard to believe that this mixtape was put together in just three weeks. Another aspect of what makes this album slightly removed from what hip hop means today is the usage of heavily distorted bass and riffs that could be found in a popular R&B song. “GOLD”, one of the popular tracks on this album, features almost all of the collective’s vocalists and showcases their talents over a futuristic beat. Songs like “GOLD” and “BOYS” emphasize the collective’s sense of confidence and assurance of their ability to shift the direction of hip hop, coupled with their effortless sense of style and grace. BROCKHAMPTON’s strength lies not in any individual, but in their ability to present and prepare a full package- from visuals to audio to even how they market themselves. Thus, making this up and coming collective one to definitely watch out for. 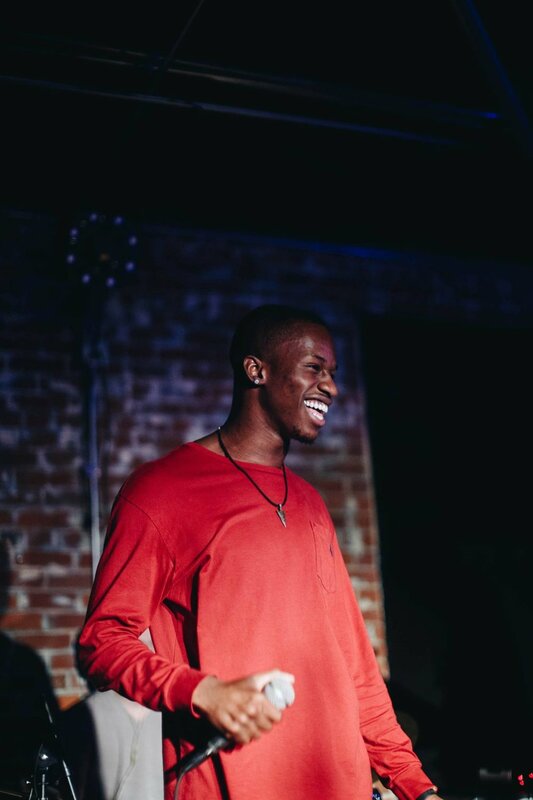 Apollo J is an aspiring artist from Brooklyn, NY who currently attends Duke University. A Poet and Spoken Word artist by training, he aims to create music that always conveys a message. His main musical inspirations include J. Cole, Kendrick Lamar, Kanye West and Frank Ocean. You can follow him on Soundcloud, Instagram, and Facebook.